How will 3D Printing/Additive Manufacturing change the way conventional manufacturing methods are utilized? Is 3D Printing just a cool process or are there added benefits and value gained to using this additive fabrication process over conventional machining methods? 3D Printing is cool, but the manner in which it is being used has greatly added to its appeal. 3D Printing is now moving beyond the prototyping and design validation stages and into production applications. If you’re manufacturing low volumes of a product, using Direct Digital Manufacturing (DDM) might be a more cost effective method for producing end-use production parts. Of course one off prototypes or even production parts can benefit from DDM, but did you know it is now being adopted and used as implants in medical applications? Another emerging industry that has begun to utilize 3D Printing are the many food manufacturing sectors. 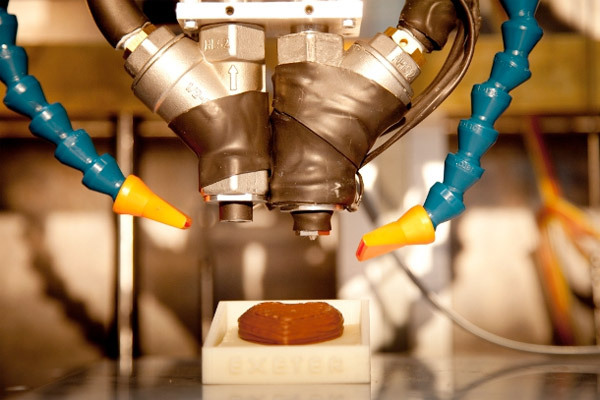 3D Printers can now produce parts using chocolate! With these new technologies emerging, how will 3D Printing be used and will it be available for the home/consumer markets at an affordable price while providing similar quality as higher end production 3D Printing machines?